On the front cover: portraits of Jean-Jacques Rousseau, Albrecht von Haller, Friedrich Nicolai, Johannes Nicolaas Sebastiaan Allamand, Elie Luzac, Montesquieu, Denis Diderot, Abraham Gotthelf Kästner, Voltaire. On the back cover: portraits of Leonhard Euler, Etienne Luzac, David Ruhnken, Adriaan Kluit, Samuel Luchtmans, Johannes Luchtmans, Pierre-Louis Moreau de Maupertuis, Jan Wagenaar, William v of Orange (See also cd-rom, list of illustrations.) Frontispiece: A portrait of Elie Luzac, plainly dressed, apparently how he wanted to be immortalized. All rights reserved. No part of this publication may be reproduced, translated, stored in a retrieval system, or transmitted in any form or by any means, electronic, mechanical, photocopying, recording or otherwise, without prior written permission from the publisher. Several craftsmen at work in the 18th-century book trade: a bookseller, a typefounder, a bookbinder and a copperplate printer. the 1760s happens to be his own publications. They appeared in great abundance, but contain almost exclusively Luzacâ&#x20AC;&#x2122;s own opinions on the booktrade and offer hardly any facts about his own business. For the second half of his career in particular I had to concentrate on his own writings, his enlightened conservative ideas and his list so as not to lose sight of Luzac. However, paucity of material was not the main motive for placing the bookseller in his social and political context. It was also my objective to define the position of the book trade within Dutch society in the latter half of the eighteenth century using Luzac as a case in point (albeit a rather atypical one). though he did enter into partnership with Jan Hendrik van Damme, born in Maassluis and a descendant of a renowned Leiden printing family. As we will see, Luzac exerted himself to offer issues of current interest. Partly they were old political conflicts centring on the relationship with the Stadholder. After a long stadholderless period, William iv had been brought to full power in Holland in 1747, though not to general acclaim. Feelings of discontent grew stronger especially when it became clear that he was doing little to curb the power of the regent class. Luzac participated in the political debate on the Stadholder as a writer and as a bookseller, as he would do later in the case of the so-called ‘War of De Witt’, when he set out his ideas on what he felt was the ideal consitutional form. One of his fiercest opponents was the Amsterdam local historian Wagenaar. Then there were also the debates on the foundations necessary to uphold society. Freedom of expression, rational religion, ethical sentiment, human happiness, the prosperity of nations and – the underlying foundation – natural law were topics Luzac addressed with his publications. In the 1780s many of the enlightened ideals appear to have acquired political overtones. Chapter six considers the way in which the printing press was used as an instrument to quicken the citizen’s political alertness. Leiden, a city with a large number of dynamic and flourishing clubs and societies, was also a city of sharply defined political contrasts. After renewed acquaintance with the Leiden booktrade Luzac’s antipode, Cornelis van Hoogeveen Jr, is introduced. Booksellers were among the most vociferous members of the public during the Dutch Patriotic Revolt, made good money as a result but in the end their involvement also cost them dearly. The curtain falls in the last chapter. The partnership between Luzac and Van Damme was dissolved and the stock was auctioned after Luzac’s death in 1796. Luzac lived to the age of seventy-five. Early one Sunday morning in November 1765, a maidservant ran into No. 63 Rapenburg, the house of her employer the Leiden bookseller Elie Luzac, to tell him that once again, for it had happened two years before, vandals had covered the entire facade of the house in tar – door, windows, woodwork, everything. When he saw what had been done, Luzac sent an errand boy to tell his landlord, a regent of the Huiszittenhuis, the charitable organisation of the Dutch Reformed Diaconate which owed Luzac’s house.1 But nobody answered the door. Two hours later, at eleven o’clock, the errand boy called a second time, but again to no avail. In the meantime passers-by must have looked at Luzac’s tarred shop front with disapproval. Perhaps the maidservant had already been trying to remove the tar, but it will not have helped much. Some of the passers-by may also have chuckled at the sight. In the end Luzac, not knowing what else to do, decided to send his shop assistant Jan Cyfveer to Arnoldus de Wilde, another regent of the Huiszittenhuis, with the urgent request to clean the facade and steps in front of the house at the landlord’s expense. But De Wilde, too, was not at home that Sunday. Frontispiece of a collection of poems published by Elie Luzac on the occasion of the 25th wedding anniversary of his parents in 1744.
zac’s name, but that of his uncle Etienne Luzac at the end of a contribution submitted by Elie.6 To this day various Luzacs are confused with one another without so much as a thought. Kloek and Mijnhardt’s standard work on the eighteenth century, 1800: Blauwdrukken voor een samenleving, lists Elie Luzac as the publisher of the Gazette de Leyde, the periodical which later on in the eighteenth century would support the American struggle for independence. This must have caused the conservative Elie Luzac to have turned in his grave. A similar mistake was made by Willem Otterspeer in his study of Leiden University when he classifies Elie as a ‘newspaper owner’. Although much can be said about the prolific Elie Luzac, he was anything but a newspaper owner. 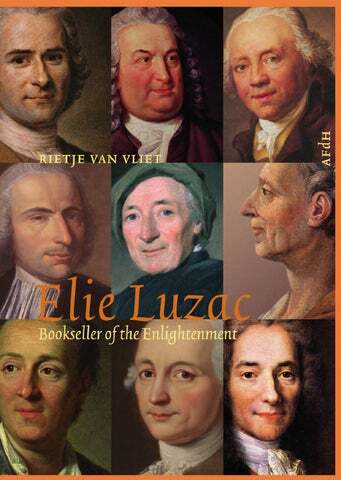 Here, too, Etienne Luzac’s reputation is confused with that of Elie.7 The various Jean or Johan Luzacs who gained some notice in Leiden in the eighteenth and nineteenth centuries also add to the confusion. Although it is tempting to unravel this tangle of family relationships and bring into focus all Luzacs who for one reason or another achieved fame, we will concentrate on the most immediate family of Elie Luzac, printer, bookseller, publisher, lawyer and jurist of Leiden. Etienne Luzac, Elie Luzac’s uncle, made a name for himself as the publisher of one of Europe’s foremost newspapers, the Gazette de Leyde. elie luzac: ‘more suited to science and literature’ Until he was about twelve years old, Elie Luzac Jr is said to have been a surly and sullen child of a retiring nature compared to his brothers and sisters. women in the life of elie luzac Elie Luzac was married three times and had two daughters from his first and second marriage. He also had an affair with a girl which resulted in a ‘love child’. Anne Danjée In the first years after Ernestine Auguste’s death Elie was fully occupied with his book business, frequently staying for protracted periods abroad, particularly in the years 1753 to 1756, setting up his business in Göttingen and visiting the Leipzig book fair. After winding up his German business interests he focussed principally on Leiden. In 1759 Anne Danjée, with whom he had an affair, caused Luzac no end of trouble. She had her son Elie baptized in the Walloon Church on 15 June,42 and named Elie Luzac as the baby’s father, which was an implicit demand for financial support. Elie, who was no longer a deacon of the Walloon Church at the time, categorically denied paternity, but was pressed by the consistory to admit to his love affair. Although he submitted a statement a month later, under much protest, that he had indeed slept with Anne Danjée,43 he refused to pay her anything for maintenance. The Leiden Justices of the Peace had to be called in to make him do so. On two separate occasions, in September and – with Elie Luzac failing to respond – again in October, notary public Albertus Kleynenberg acted pro bono on behalf of the unmarried mother to claim the amount of 18 guilders and 15 stivers, being the sum for maintenance for the period of six weeks.44 The brief affair between Anne Danjée and Elie Luzac – assuming that there had been one – ended in acrimony. In 1760 Elie was still not prepared to assume responsibility as father of the baby. Accordingly Kleynenberg summoned the Walloon minister and the elders on behalf of Anne Danjée to appear before the Justices of the Peace, to enforce through the mediation of these parties a maintenance order on the alleged father. This time Kleynenberg was successful, but for the rest of his life Luzac maintained a deafening silence on the subject of Anne and his illegitimate son Elie in all his extant letters to correspondents. Interior of a printing-house (c. 1725). bored him. Apparently he was too restless to sit still for long.65 Even as a young man he had been interested in the latest scientific developments and contributed his share to scholarly debate. Sometimes, during a conversation, an academic question would grip him so much that he would suddenly have a eureka experience, abandon whoever he was talking to and rush upstairs to note down the solution to the problem.66 As a practising lawyer he concentrated on giving legal advice. It is unclear how much income Elie derived from his legal career, or how much time he devoted to it.67 He also had his daily responsibilities as a printer and a bookseller, although, as we shall see, he mainly concentrated on maintaining his network and looking for new authors for his list. His ‘natural alertness and wit’68 were assets which stood him in good stead, not only in his scholarly work and legal practice, but also as a bookseller. hired his first staff. With six men working in the printing house he had enough staff to take on printing jobs for others. In 1744 his brother Isaac Elie entered his employment as an apprentice, followed two years later by a third brother, Pieter.74 Luzac rarely printed at his own expense in the early years because he did not have the funds to finance his own publications, as was common enough in the case of small firms. The Leiden firm of Luchtmans’ ledgers for 1746 list Elie only as a ‘printer’; purchases by Luzac are exclusively entered on the debit side. Until the year 1755 Elie Luzac advertised in the Leydse courant as ‘Printer and Bookseller’. Samuel and his younger brother Johannes Luchtmans made a great success of the Luchtmans publishing firm. A University in decline: from the 1730s, renowned scholars like Boerhaave had been replaced by narrow-minded pedants and compulsive gossips. remaining populace lived at or around subsistence level, there nevertheless still remained a fairly broad layer of the population able to afford some cultural diversion, such as buying and reading books. The question is, however, whether the demand for books was large enough to keep the many booksellers in town afloat. There were also the professors and students to help support local trade, but the University, too, was in decline. As the historian Willem Otterspeer has written, renowned scholars of the calibre of Herman Boerhaave, Gerard Noodt, Tiberius Hemsterhuis and Willem van ’s-Gravensande had made way for extremely closed minds, self-important provincials and compulsive gossips. University buildings and academic collections were antiquated, dust-covered or even dilapidated. From the middle of the seventeenth century student numbers began to drop. In the period 1700-1724 some 299 students matriculated annually, but for 17251749 the annual average had already dropped to 240 students, while between 1750-1774 the average plummeted to 114 students. The decline in the number of foreign students was also greater than that of domestic ones.90 The book trade, too, suffered under the recession. Many booksellers in The Hague had gone bankrupt in the 1730s partly as a result of reckless investments in vast publishing projects and a frenzied merry-goround of mutual auctions.91 Apparently the consequences for the trade as a whole were limited, because the Thesaurus shows that the number of active booksellers in the Dutch Republic increased from 276 to 327 in the years 1730 to 1740. The following period, until 1745, also showed a remarkable increase of no less than 49 in the number of new entrepreneurs. Never before or afterwards during the eighteenth century did so many newcomers enter the bookselling market in such a short space of time. This may perhaps be explained by the phenomenon, alluded to by the Dutch book historian José de Kruif, that in a saturated market, with a great many active suppliers of ‘volatile products’, competition and the number of imitations is high.92 But was the market really saturated? The increase may also have been due to a growing demand for political publications, with which the Dutch could feed their dissatisfaction with government by the ruling classes. Johannes van Kerckhem, Wouter Leffen, Johan Luzac, Jacobus Willeke and Jurriaan Wishoff all had their shops there. Another printer to move to Steenschuur was Jan Huback, who had not been included in the tax record of 1742. Elie Luzac was his lodger at the time. All the same Elie Luzac, new to the book trade, encountered his share of financial problems during his early years. In 1749, when he had already built up a small but high-quality list, he was still forced to turn to his father and uncle for the amount of 1,347 guilders and 5 stivers. He needed the money for the books bought at the Langerak auction of 17 to 22 March 1749.99 Later Elie signed a promissory note to his father for the amount of 13,000 guilders, the sum total of his loans so far.100 In that same year he was even forced to delay by a year the publication of Le philosophe chrétien, written by the secretary of the Prussian Academy of Sciences, Jean-Henri-Samuel Formey. ‘Je suis jeune libraire’, Luzac wrote to the author by way of apology, ‘j’ai fait des depenses assez considérables cette année.’101 His Leiden contacts in particular gave him so much work to do in his early years that he had to be careful with his budget. contributed to the learned debate on materialism, which may be regarded as almost logically following from the debate on Cartesianism and Newtonianism. 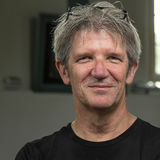 John Turberville Needham’s Nouvelles découvertes faites avec le microscope discussed spontaneous generation of nematodes and the evolutionary concept of epigenesis. The story of Luzac’s quest for his own niche within the Republic of Letters opens with the pond at Sorgvliet, the country estate owned by the diplomat Willem Bentinck between The Hague and Scheveningen. A brook springing from the dunes fed clear water into the pond. What went on within the pond led to close observations and experimentation. Together with his pupils Abraham Trembley, the Genevan tutor of Bentinck’s children, had fished hydras from the pond, cut them into little pieces and to his astonishment witnessed their regenerative powers. While Antonie van Leeuwenhoek still thought they were plants, Trembley came to the conclusion that these creatures were animals and that their reproduction took place in a way altogether different from what one might imagine on the grounds of Church doctrine. Each bit of polyp appeared capable of growing into a new polyp without fertilization having taken place. When the French entomologist René Antoine Ferchault de Réaumur, famous for his Histoire des insectes (1735), heard about Trembley’s discovery, he immediately grasped its significance. He saw to it that Trembley’s observations were placed on the Royal Society’s agenda for the sessions of 13 and 20 January 1743. A letter of recommendation by Bentinck was read to the assembly and Trembley’s text was included in the Philosophical Transactions. The polyp observer could hardly have received a greater accolade.3 Since the invention of the microscope in the 1670s, a great many scholars had acquired the instrument. All sorts of objects were put underneath the magnifiying glass. Experiments with lower animal species, too, were popular. The English divine John Turberville Needham, for instance, conducted pioneering microscopic research into the generatio spontanea of nematodes (roundworms and small eels) and maggots. His discussions with Trembley on the subject led to the publication of his An account of some new microscopical discoveries (1745). Abraham Trembley and the children of diplomat Willem Bentinck conducting experiments on polyps (1744). Bonnet discussed the findings he had incorporated in his Essai de psychologie (1754) warned him that his ideas might be dangerous, because they contradicted Church doctrine. After all, they were not all that far removed from the materialist thinking already expounded by La Mettrie in his L’homme machine (1748), a work universally banned by censorship.5 To La Mettrie, Trembley’s discovery was especially important because the polyp’s ability to reproduce after artificial division showed that like matter, the alleged ‘soul’ was present everywhere in the body. Both matter and soul appeared capable of being divided infinitely. La Mettrie took this as confirmation of Descartes’ idea that animals were only made up of matter and therefore to be compared to machines (bête machine). La Mettrie linked his conclusion to the opinion Bonnet had reached upon reading Trembley’s work, namely that polyps were the missing link between plant and animal, with man being the highest evolutionary stage in the chain of beings. But where Bonnet maintained that souls were preformed and continued to award the soul a central place in the human body, La Mettrie offered a materialistic explanation. In his opinion it was inevitable that man, too, was an automaton, a machine (homme machine).6 Few books have created such an outcry in ecclesiastical circles as L’homme machine. The soul, as is stated in Genesis 2, v. 7, is given by God, and returns to God after death. According to the theologians, La Mettrie’s interpretation was Spinozistic in nature: although man does have a soul, it is a vital force and as such part of the material reality of the human body. There exists, therefore, but one substance. The soul is no longer an autonomous entity, as it is in Church doctrine, but a specifically human attribute, responsible for self-awareness, reason and the mind. By denying that the soul was a ‘second’ substance, La Mettrie negated the idea of the dualism of body and soul. Although he was not explicit about the subject, he believed the logical consequence must be that the soul was transitory. There was consequently no hereafter where man was called to account for his sins. This also undermined the Christian foundation for virtuous conduct; it no longer mattered all that much. Not surprisingly, hell and damnation were wished upon La Mettrie, and he was forced to flee from his country.